Senior veteran households represent 55% of the 22.7 million veterans in the United States. Generally, once a senior veteran or a family member has been made aware of the aid and attendance benefit, the veteran or family member will eagerly seek out an individual who can explain these benefits in more detail. Only about 5% of U.S. seniors are actually receiving this benefit. Please call (800) 989-8137 if you would like to speak to us directly about the CLE Course to Maintain Your VA Accreditation, the VA Accreditation Study Materials, or any other item listed on this page. We also invite you to become a member of the NCPC starting at $8/mth. Your membership, among other benefits, will include an advertising listing(s) on our site, your own personal sales (web) page, and access to the member section. According to 38 USC § 5901 and 5904, no person may help a veteran with an initial claim for benefits unless that person is accredited through VA. Additionally, no fee may be charged that is directly related to the filing of an initial claim. Doing so is illegal. Many members of the NCPC are accredited and no member of the NCPC charges a fee that is directly related to the filing of an initial claim. We offer 3 designs for you to choose from. Each site is search engine optimized and targets senior veterans for you to advertise your services to online. You can choose and own your domain name. We charge a set-up fee to create the site and host it for one year. After the first year, the cost to maintain the site, host the site, and membership is $19.00/month. 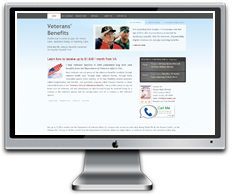 Your contact information, website, and sales message will be placed on 2 uniquely targeted, one-year listings of your services that is tied to the most highly visited page on our website -- one that deals with veterans benefits. Only those people who have purchased a web site are allowed to participate in this unique listing service. This popular page receives 6,000 to 7,000 unique visitors a month where you will likely receive a number of leads from this year-long listing. It produces more lead requests from visitors than all of the other thousands of listings on our site combined (our website -- www.longtermcarelink.net -- receives approximately 80,000 visitors a month). To view a sample of this listing please go to www.veteransListing.com. Your listing on this page is linked to a uniquely optimized veterans benefits website that we create for you.